Rarely used functional - Running Feature Paint. Beginners do not know, others forget. Feature Paint allows you to copy feature parameters from one feature to others. Feature Paint allows you to copy feature parameters from one feature to others that you select. For instance, you can select a boss-extrude from one part and apply its parameters (such as depth) to another boss-extrude on a different part. You can also select two different features and apply feature parameters. For example, select a sweep feature to apply its parameters (such as the texture and transparency properties) to a dome feature. Sheet metal features are supported. Unsupported sheet metal features: bend, fold, unfold, and welded corner. If the source feature does not have texture but the target feature does, the target feature retains its texture properties. Reference geometry entities cannot be painted from one feature to another. For example, an end condition of Up To Surface that references a surface cannot be painted. Click Feature Paint (Tools toolbar) or Tools, Feature Paint. The Feature Paint Task Pane opens. In the graphics area, select the feature whose parameters you want to copy. <feature name>@<part name>.sldprt appears in the Copy properties from box. 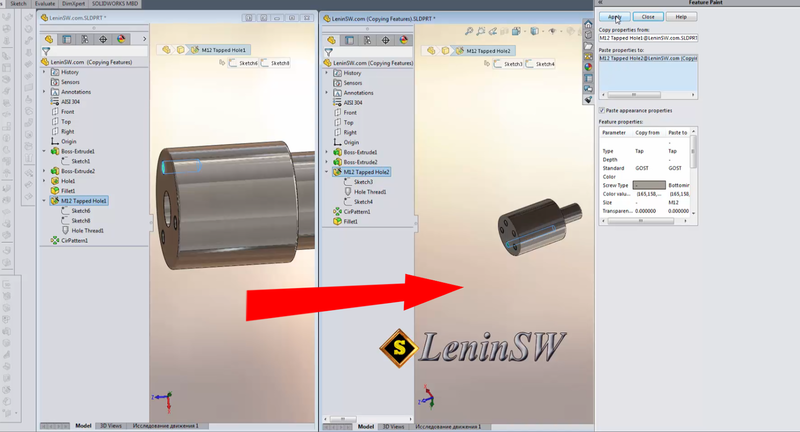 In the graphics area, select one or more features to which you want the parameters applied. You can select a feature in the current part, or select a feature from a part in another open window. 1.<feature name>@<part name>.sldprt appears in the Paste properties to box. Parameter. The feature property to be copied. If there are no attributes listed in the Feature properties box, then no attributes are available to copy. Select Paste appearance properties to apply appearance properties (color, texture, and so on) only. The new attributes are updated immediately.